Sulphate precipitation may be compulsory before discharging into the drains (affecting concrete) or if the water is to be re-used (scaling) and even to comply with certain discharge requirements. In both cases, precipitation as heterogeneous crystals is very slow. In order to avoid supersaturation and dangerous post precipitation, this reaction has to take place in the presence of a high concentration of seeds (> 20 g · L–1). 1.5 to 2.5 g · L–1 SO42– when neutralising acid water using lime without using CaCℓ2. A second process is the precipitation of barium sulphate by adding BaCℓ2. The residual solubilities obtained are below 20 mg · L–1 but the reagent is extremely expensive and rarely used. With a pollution that is primarily fluorinated and sulphuric or hydrochloric, the precipitate will be based on CaF2 whose crystallisation and precipitation will have kinetics that lie between those of CaCO3 and gypsum. These units have dimensions that are close to those of units used for carbonate removal but reaction times will be extended. 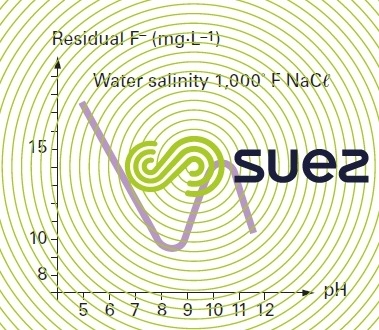 from 20 to 40 mg · L–1 in saline effluents. Dissolved aluminium in noticeable concentrations is an adverse sequestering element. Conversely, in the event of a massive coprecipitation of Aℓ(OH)3 or Mg(OH)2, these hydroxides adsorb fluorides and can decrease residual solubility. Based on an Aℓ/F = 1 ratio, this adsorption will produce fairly low F– residual levels (2 to 4 mg · L–1). The F– concentrations obtained depends on the Ca2+ enrichment of the medium. Copious and highly hydrated precipitation of silica gel takes place slowly and sludge thickening will be the factor that determines the settling tank capacity. polyphosphates and hexametaphosphate in cooling circuits (see precipitation inhibitors). non-acid water: through Aℓ or Fe salts (formation of metal phosphates). Tricalcium phosphate has a residual solubility of a few mg · L–1 as P2O5 but as a colloid. It settles slowly, even when a flocculent is added. above pH 10, calcium phosphate co-precipitates with magnesia with residual levels below 1 mg · L–1. AℓPO4 and FePO4 are low-solubility salts but that will precipitate in their colloidal state. The precipitate is eliminated through flocculation over a metal hydroxide excess (figure 9). 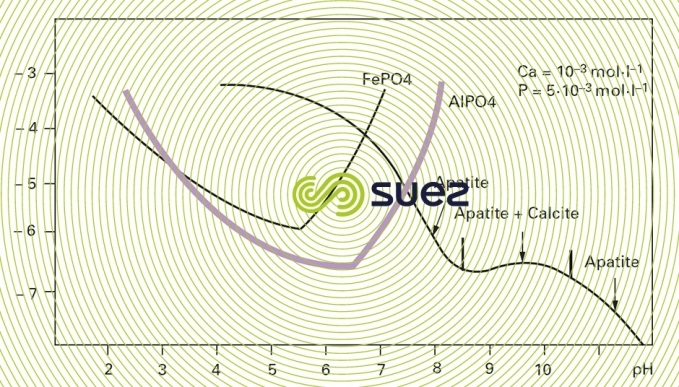 The residual values obtained for P can be significantly lower than one mg · L–1 by using relatively high amounts of iron or aluminium salts.